In line with growth strategies Brett Osborn and Morris Golombick recently travelled to INDAR in Spain for training. The INDAR ISMML series is composed of submersible, water-filled and cooled motors designed for driving submersible pumps in a wide range of submerged applications. The relationship between CAW and INDAR has strengthened over the past years with CAW establishing a repair agreement locally for Sub Saharan Africa. The week long training involved the Assembly of a ML53 Submersible unit as well as training on quality and testing procedures. The trip was followed up with meetings held at Bakker in Amsterdam. 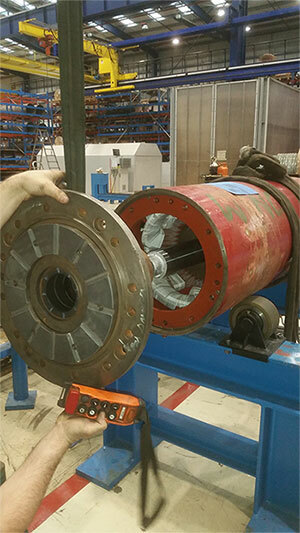 CAW has equally established a long standing relationship with Bakker on the repair and maintenance of INDAR Submersible oil filled Dredge pump motors. At present CAW has 2x 2400kw motors in its Cape Town workshops for repair. Our aim would be to grow the Sub Saharan repair market to ensure that these units are repaired locally and not sent to Europe any longer. The alliances we have formed together with facility upgrades locally, mean that long term benefits and cost reductions to CAW clientele and future clientele can be provided.